ALBUM OF THE WEEK: Rumours is one of those albums where you know every song. Even if you think you don't, they've crept in by soft rock radio osmosis. The band work on Mac time, so this 35th anniversary reissue actually arrives 36 years after the album was released in February 1977. 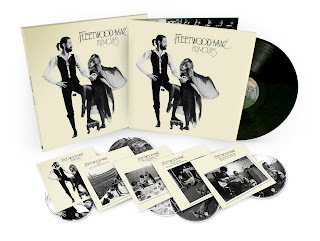 Rumours - already in 40 million homes - is one of the most complete albums in history and was fuelled by class A harmonies, class A drugs and beautiful music being made in studios and bedrooms between band members. The vaults have been raided for more unreleased demos to show rock classics as works in progress. Lindsay Buckingham sniffles his way through an early take on Second Hand News with mumbled vocals and a runny nose and there's Go Your Own Way with lyrics - and vocals - that were yet to be polished. Buckingham says "That was good" at the end - he clearly hadn't heard his flat vocals back yet. An early demo of Stevie Nicks' timeless Dreams manages to be acoustic but also intense. The album was so strong gems such as Nicks' Planets Of the Universe were left off - she'd later finish it and release it in 2001. "Did you get that? It wasn't wonderful or anything," Nicks says at the end of this demo. She's wrong. Her early Gold Dust Woman rocks too. There's Christine McVie's Keep Me There (once called Butter Cookie) which ended up being an album highlight and The Chain (a Nicks solo version of which is a find here). One of McVie's songs that did make the album (and made the album), Songbird is here in simple demo form - it'd be honed vocally later to become a soundtrack to weddings for decades to come. There's also an instrumental Songbird for Mac trainspotters' karaoke competitions. Deluxe versions have a warts-and-all, un-airbrushed live concert from 1977 (check out Rhiannon), which captures a band who really loved each other flying high in their prime. In stores in Australia - Friday, February 1st.